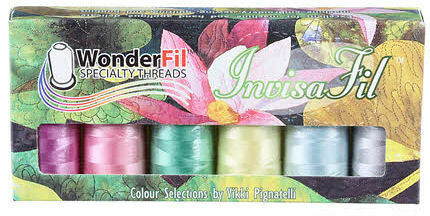 WonderFil Invisafil pre-packs are sets of 6 400 meter Invisafil Threads arranged by color. B006 Winter Sky Grey, Pale Aqua, Icy Lemon, Simply Green, Perfectly Pink, Clover. 6 400 meter spools.